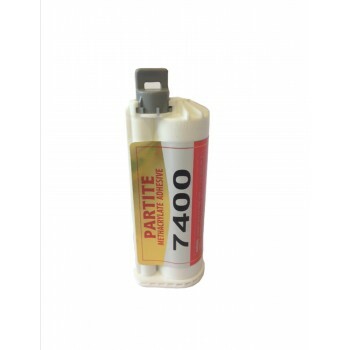 Partite 7400 2-part Plastic Bonder Adhesive for low surface energy plastics- 50ml concentric cartridge including single static mixer. PARTITE 7400 is a two-part adhesive system specially design to bond low surface energy plastics including many grades of Polypropylene, Polyethylene, TPO, UHMWPE, Teflon, etc. without any use of primer or any surface treatment. This adhesive is an easy to use 10:1 ratio that maintains its strength over a wide temperature range with excellent humidity and water resistant. You're reviewing: Partite 7400- 50ml concentric cartridge including single static mixer.